Q1. An engineer is preparing an implementation plan in which the configuration needs to influence BGP’s choice of best path. Which of the following is least likely to be used by the configuration in this implementation plan? Answer: B. Weight and Local_Pref were created for the purpose of giving engineers tools to influence the BGP best path choice. AS_Path was created for loop avoidance, but AS_Path length can also be manipulated (for instance, with AS_Path prepend) to influence the best path choice. Although the Origin PA can be changed by configuration for the purpose of influencing the best path decision, the intent of this PA is to identify the source from which the route was introduced into BGP. Additionally, the best path algorithm considers the Origin PA after the other PAs listed in the answers, making Origin the least useful of these answers for influencing path choice. Q2. Router R1 learns two routes with BGP for prefix 200.1.0.0/16. Comparing the two routes, route 1 has a longer AS_Path Length, bigger MED, bigger Weight, and smaller Local Preference. Which of the following is true about Router R1’s choice of best path for this prefix? a. Route 1 is the best route. b. Route 2 is the best route. c. The routes tie as best, but one will be picked to be placed in the routing table based on tiebreakers. d. Neither route is considered best. Answer: A. Of the items listed in the question, Weight is the first one considered in the best path algorithm, with a bigger weight being better. As a result, Route 1 is the better route of the two. Q3. Router R1 learns two routes with BGP for prefix 200.1.0.0/16. Comparing the two routes, route 1 has a shorter AS_Path Length, smaller MED, the same Weight, and smaller Local Preference. Which of the following is true about Router R1’s choice of best path for this prefix? Answer: B. Of the items listed in the question, Weight is the first one considered in the best path algorithm, and it is a tie. The next item considered, Local Preference, uses bigger-is-better logic, so Route 2 will be considered best. a. Configuring the neighbor weight command on Ent1. b. Having the ISPs configure the neighbor route-map out command on ISP1 and ISP2, with the route map setting weight. c. Configuring the set weight command inside a route map on Router Ent1. d. Configuring a prefix list to match all class C networks. Answer: B and D. Weight, a Cisco-proprietary feature of BGP on Cisco routers, cannot be transmitted in a BGP Update, so setting Weight on an outbound route map at the ISPs will have no effect. Also, the goals call for setting Weight for all routes from an ISP to the same number, so creating a prefix list to match a subset of reachable prefixes, in this case all class C networks, is not useful. However, two methods of configuring Weight do exist: the neighbor weight command and configuring an inbound route map with a set weight command in the route map. a. R1 has a neighbor 1.1.1.1 command configured. b. R1 has a neighbor 2.2.2.2 command configured. c. The show ip bgp command lists a line for 190.1.0.0/16 with both an “>” and an “i” on the left. d. R1 is in ASN 1. Answer: B and C. The line reading 1.1.1.1 from 2.2.2.2… implies the BGP RID of the neighbor is 1.1.1.1, with neighbor ID–the IP address on the local router’s neighbor command–of 2.2.2.2. The end of the output shows that the route is internal (iBGP learned), and the output lists the word “best,” so the show ip bgp command will display both the > and i for this route. Finally, the output does not identify the local ASN, although it does list the AS_Path of the route (1, 2, 3, 4). Q6. An Enterprise router, Ent1, displays the following excerpt from the show ip bgp command. 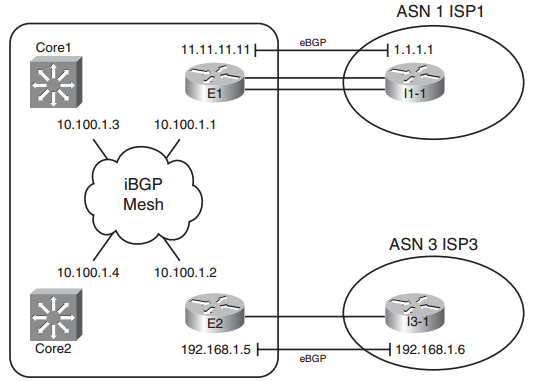 ENT1 has an eBGP connection to an ISP router with address 3.3.3.3 and an iBGP connection to a router with address 4.4.4.4. Which of the following is most likely to be true? a. The Enterprise likely uses ASN 1.
b. The neighboring ISP likely uses ASN 1.
c. The route has been advertised through ASN 1 multiple times. d. Router Ent1 will add another ASN to the AS_Path before advertising this route to its iBGP peer (4.4.4.4). Answer: B. The output shows the results of AS_Path prepending. The repetitive 1’s cannot mean that the route has been advertised into and out of the same ASN repeatedly because loop prevention would have prevented such an advertisement. With AS_Path prepending, the neighboring ASN typically adds its own ASN to the end of the AS_Path (as listed on the left of the output). Q7. The following line of output was gathered on Enterprise Router Ent1 using the command show ip route. Which of the following answers is most likely to be true, based on this output? a. This router has set the Weight of this route to 10.
b. This router’s BGP table lists this route as an iBGP route. c. This router’s MED has been set to 10.
d. This router’s BGP table lists an AS_Path length of 10 for this route. Answer: C. The command lists the administrative distance as the first number inside the square brackets and the MED values as the second number in brackets. The AD of 20 implies an eBGP route instead of iBGP. The output says nothing about the Weight or AS_Path length.